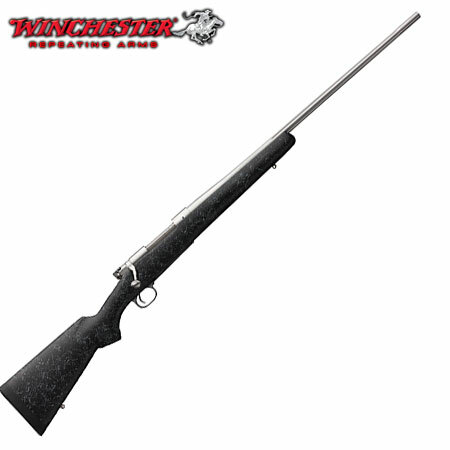 Online ShopHome » Products » Winchester Model 70 Extreme Weather .243 Win SS. Exception bolt-action hunting rifle for adverse weather, Bell and Carlson stock, aluminium bedding block, matte stainless action and fluted barrel, M.O.A. trigger system, Pachmayr Decelerator recoil pad. Get extreme accuracy under any conditions. The Model 70 Extreme Weather Stainless utilises a Bell and Carlson lay-up composite stock that provides a solid feel and features trim and lightweight ergonomics. It has a textured charcoal grey matte finish for rugged good looks and improved grip in adverse conditions. The sculpted cheek piece helps insure proper eye-to-scope alignment from any shooting position. The thick, black Pachmayr Decelerator pad helps take the felt recoil bite out of high performance magnum cartridges. Other key features. Like all Model 70s today, it features the Pre’-64 type claw extractor with Controlled Round Feeding so the cartridge may be easily withdrawn from the chamber at any point after it leaves the magazine. It also means that the cartridge base is grabbed by the claw as it leaves the magazine so it enters the chamber straight, in line. And don’t forget that the cartridge feed lips are machined as part of the receiver for improved reliability in feeding. The classic Three-Position Safety offers both on safe and fire positions, plus a middle position that locks the firing pin yet still allows the bolt to be operated, providing a greater margin of safety when checking the chamber condition or unloading. Accuracy is paramount. The Extreme Weather SS rifle’s free-floating fluted stainless steel barrel is made in the same factory as those found on U.S. military rifles and machine guns, and features a recessed target crown to protect the rifling. With quality optics, premium ammunition, and good shooting conditions, 1 MOA accuracy can be expected — if you, your ammo and your optics are up to it. 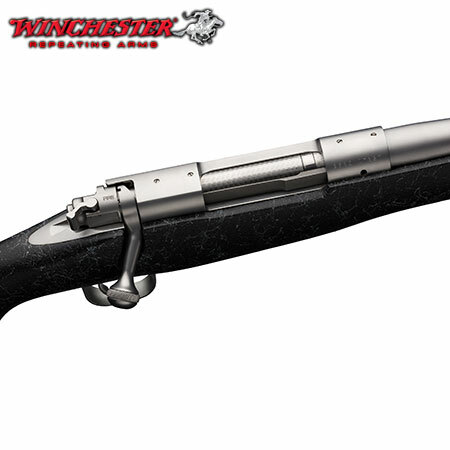 The fluted barrel allows us to give you a stiffer barrel profile that does not carry excessive weight. So the Extreme Weather SS feels very light but offers accuracy of a heavier rifle. Two stainless steel sling swivel studs are installed as expected. 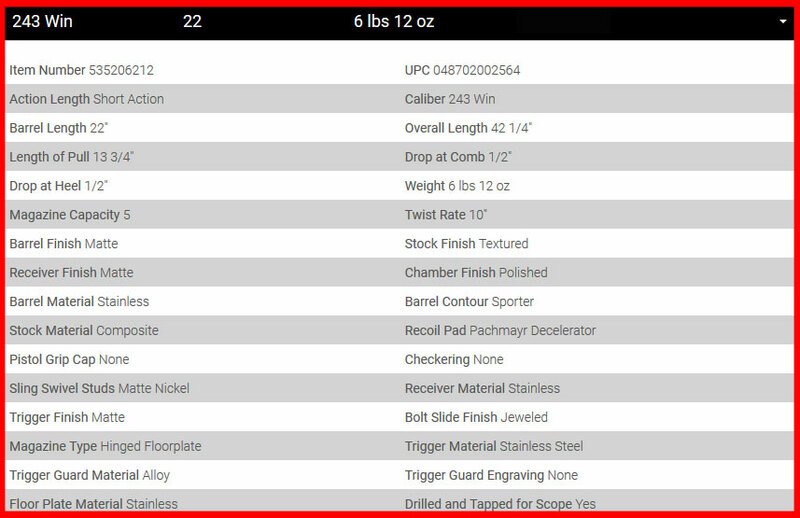 In fact, all major components are stainless to keep you gun looking and working well year after year in tough conditions. You will need to buy scope bases and rings to match your set-up separately, so don’t forget. (The scope and mounts in the photo above are not included.) The line-up of hunting calibres is more than adequate, taking you from crossover big game/varmint calibres to hard hitting magnum calibres sufficient for practically everything you could want to hunt: . . . whitetails, mule deer, elk, sheep, goats, bears, moose, etc. Check the blogs and you’ll read how many consider it the perfect elk rifle. Bell & Carlson makes a uniquely high-quality product. That is the reason Winchester Repeating Arms has teamed with them over the years to produce our finest speciality rifles. With features like a proprietary moulding system that maximises strength and one of the industry’s most acclaimed aluminium bedding block designs (for a total lock from action to stock), you get superb accuracy, ideal balance and strength only possible with non-traditional stock engineering. The Extreme Weather does not have a traditional injected type stock. 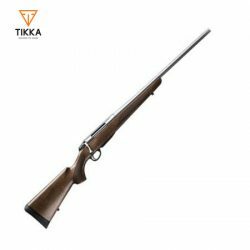 As per specifications developed by Bell and Carlson and Winchester Repeating Arms, the stocks are “constructed using a ‘hand lay-up’ process, using a variety of composite materials. These composites — including fibreglass, aramid fibres, graphite, epoxy gel coats and laminating resins; and polyurethane reinforcement with milled fibreglass — provide a warm and solid feel rather than the hollow feel one gets from injection moulded stocks. The Extreme Weather stock is reliable over a temperature range of -50 degrees to +140 degrees Fahrenheit for extreme stability under any heat and cold conditions you might encounter around the world: Alaska to Arizona and beyond. 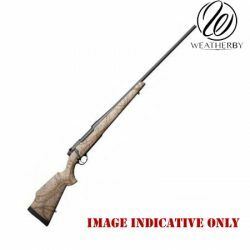 Weatherby Mark-V Outfitter 300 Win. Mag Custom Shop. 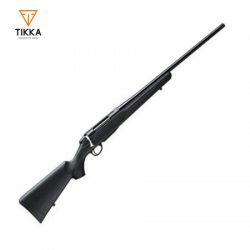 Tikka T3x Hunter Stainless Rifle.